Last year KPMG International published a survey of global construction project owners- the stats are not new. The report detailed that the worst performance occurred on public sector projects, energy and natural resource projects, where 90% and 71% respectively suffered one or more underperforming project in the previous year. Only 25% of all projects came within 10% of their original deadlines in the past 3 years. The single biggest reason for underperformance- 69% of owners identified poor contractor performance. Is it the chicken or is it the egg? Perpetuating poor performance only increases risk and costs. Personally, I see remarkable construction project performance being achieved by contractors every day- maybe innovation and improvement isn’t as fast or as comprehensive as we all would like, but real progress is being achieved. Some of the companies leading innovation and improvement are, as you might expect, big global contractors with substantial resources; but some are small but smart niche players. The common trait amongst them is a commitment to constantly ask, how can we do better? Traditional methods and the status quo aren’t acceptable in these companies. There is a vision for improvement that goes beyond “not making mistakes”. So we know high performance is not only possible, it’s happening. How can you get more projects delivered on time and under budget? 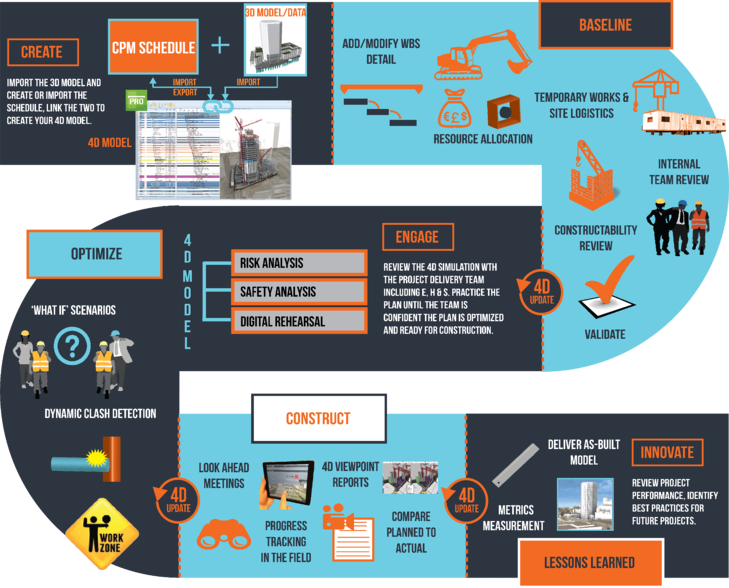 The construction industry needs owners to step up, encourage and lead improvement; require optimized and validated 4D schedules that include resources and temporary works, require cooperative planning and digital rehearsal sessions with the delivery team, require weekly tracking of progress with planned to actual reporting. Times have changed, specifications and technology must also change. If contractors are left to determine how innovation will evolve, then have to “sell” new technology to owners, the pace of change will be slow indeed. Owners- lower your risk, demand transparency and expect clear understanding and reliable forecasts. There are purpose-built 21st century tools that are making big impacts- embrace them by upgrading your project management specification for your CPM schedule submissions. A schedule shouldn’t be tossed aside the first week of the project, or be used simply as an audit tool when delay claims come rushing in at the close of the project. The construction schedule should be the foundation of successful project delivery. 4D planning and scheduling has been around since the late 1990’s. It’s not rocket science (it is your project time machine) and it’s not about glossy movies to animate great design. If you aren’t familiar with it, start a pilot project to test it. True 4D scheduling integrates the CAD design model with the CPM schedule in a process that will quickly and accurately create, edit, validate and optimize your project plan and schedule- include critical spatial oriented resources and the specific temporary works as designed by your construction engineers to deliver the project as planned. 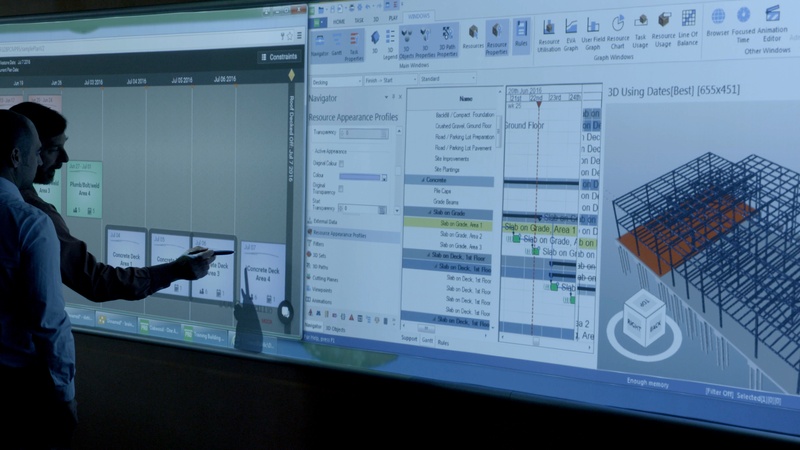 4D is the most efficient and powerful way to plan and manage a project because it is visual. It drives cooperation and transparency. It allows you to identify and resolve design, space & time risks upfront when costs are low. It is a high value/ manufacturing precision environment to test alternatives and to optimize sequences from preconstruction through to delivery and operation. So…owners ask yourself, what is your 2016 strategy to improve project performance? Stop pointing fingers at the contractors who you need to understand and trust. Develop a reliable strategy to dramatically improve performance and to decrease your risk. Start LEADING.